Hi Everyone! 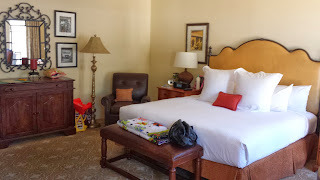 I thought I would share a bit about our trip to La Quinta, CA. Next to Palm Springs. Every year, we go on a business trip to La Quinta. It's a huge resort - a golfing resort. Both Bruce and I do not golf or watch it, but I understand this is a great place for golfing! La Quinta has over 40 + pools! It's a beautiful place. Very relaxing. 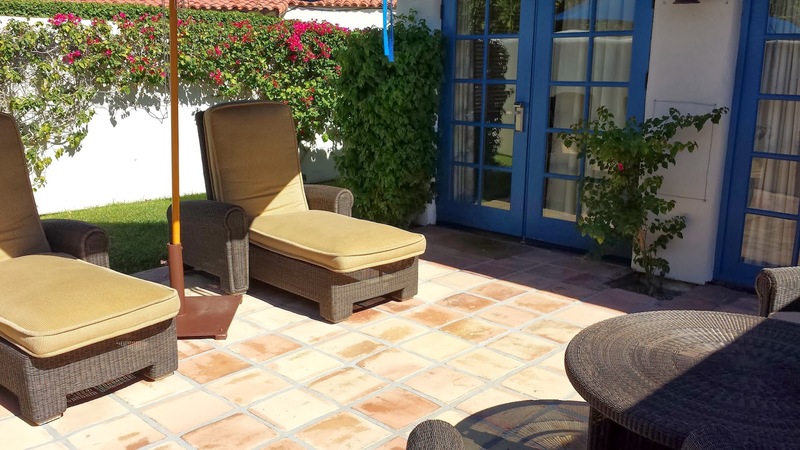 This time our room was enclosed with a wonderful patio area! My husband's business is a chain of convenience stores. He has been in the business all of our married life. 38 years! He has his own company now. Coremark is a company that supplies groceries for our stores. Once a year they bring us together with vendors so that we can buy what we want for the next year. good for us, good for Coremark and good for the vendors! Most of the business part of our trip, meals, just about everything is around the Eisenhower Pool and Room. Apparently Dwight and Mamie had there own suites there. And yes Mame had her own bedroom. 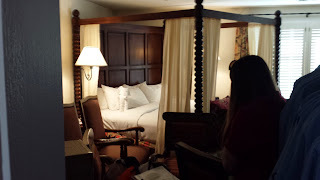 One of the Coremark people took me into Ike's bedroom! it was stuffed to the gills with furniture. Because everything was stuffed in there to make room for the samples. Sorry about the picture. the bed is beautiful. Didn't get to see Mamie's room. there have been a lot of celebrities who have stayed at La Quinta. This year was a bit of adventure for me. We got in late Monday night. On Tuesday as I was sitting up everything, I realized I didn't have my cord for the internet. Walgreens was the closest store, so off I went. bought my cord, came back to the room and the key wouldn't work. got back into the car (the main building was far enough away, I didn't want to walk). got new keys. one of the bell boys wanted to go back with me to the room to make sure the key would work. 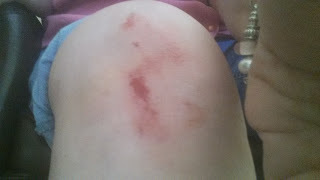 as we were walking back to my car, on the cobblestone type of road, I tripped and fell....... sigh.... really? in front of all these people? The other knee is fine, just bruised. they called security, had a paramedic (they have their own!) She doctored me up. I don't think I have skinned my knee for a very long time - like years!!! They wouldn't let me drive back to the room. So a bell boy drove the car back, I was taken in a golf cart. The key worked great and I was told to keep it away from my phone or computer. ok...... I opened the cord I had bought and it was the wrong one. What? I was not going out again. by that time it was lunch and I needed to be on the other side of the resort. Had to call for a golf cart to take me. Came back to room, and the key wouldn't work! What? There were some landscapers by the room and I talked to them. They called and had someone bring new keys. again I was told to keep the keys away from electronics. It had demagnetized some how.